NEW: macOS with TeamViewer Monitoring & Asset Management is here! 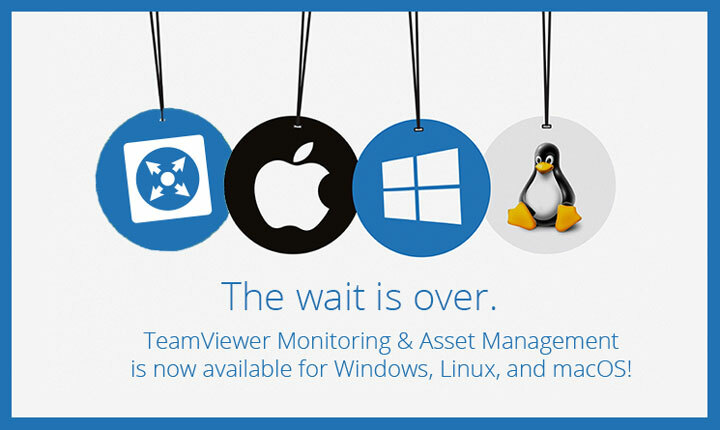 Finally, TeamViewer Monitoring & Asset Management is available on Windows, Linux, and macOS! Have a diversified IT portfolio? No problem! Our platform will enable you to provide a comprehensive service to your customers. Ensure the stability and security of your IT infrastructure by proactively monitoring all deployed assets across the leading operating systems. Expand your horizons and service customers utilizing the leading operating systems. Nothing can hold you back now!s cancel. Remember: please give us feedback! Let us know what you think in our community, so we can continue to improve our products!